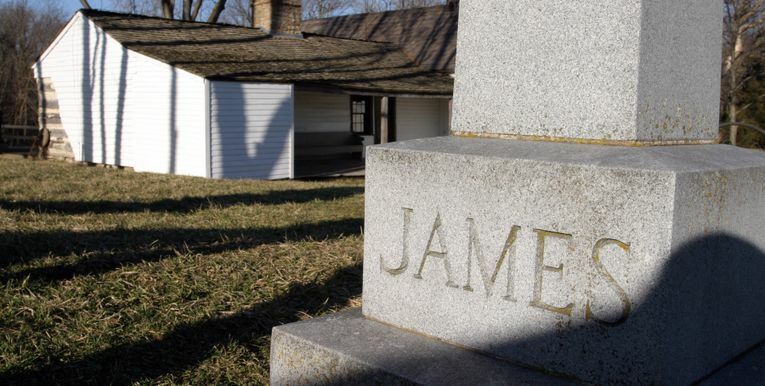 DESCRIPTION: Located in nearby Kearney, Missouri, the Jesse James Birthplace features the world’s largest display of James family artifacts and the Jesse’s original gravesite. Guests tour the authentically preserved farm house where Jesse James was born in 1847. LOCATION: Approximately 30 minutes north of downtown Kansas City. The tour begins at the museum with an introductory film about the James Family and the history of Missouri leading up to the Civil War and after. Many family artifacts are on display in the museum including guns and the boots Jesse was wearing when he was killed by Bob Ford. Guided tours of the farmhouse are offered daily. The home has been historically preserved and features James family furnishings and personal belongings. Guests are encouraged to browse the museum store. A wide variety of books relating to the period are available as well as t-shirts, mugs and other souvenirs. Memorial Day-Labor Day. : 9 a.m.-4 p.m. daily. HISTORY: Jesse James, son of a Baptist minister, was born at the family home in 1847. Barely 16, he followed his older brother Frank into the Civil War. While Frank rode with Quantrill’s guerrillas, Jesse rode with Bloody Bill Anderson. After the war ended Jesse returned home and joined other former Confederate guerrillas in a life of outlawry. Guests tour the farm home purchased by Rev. James and his wife Zerelda. Jesse was born in the cabin bedroom. Jesse parents purchased the property in 1845. After Jesse’s death, his mother, Zerelda gave tours through the cabin. Frank and his son Robert continued to give tours as did Jesse’s grandsons. Jesse’s grandsons sold the property to Clay County in 1978. The county restored the cabin and visitors from all over the world still come to tour the James Family cabin. WHERE TO GET LUNCH: Try Stables Grill, La Fuente Mexican Restaurant or Gino's. WHAT’S NEARBY: The Jesse James Bank Museum is a 15-minute drive south to downtown Liberty, Mo. Located on the historic Liberty Square, the bank was the site of the first daylight robbery during peacetime. Watkins Woolen Mill State Park and Historic Site is located four miles east of the James Farm. Both sites are open year-round. ANNUAL SPECIAL EVENTS: Three Old West Black Powder Shoots are held annually at the Jesse James Birthplace. The town of Kearney, Mo., hosts the annual Jesse James Festival the third weekend in September. The event features a carnival, barbecue contest, parade and a rodeo. DID YOU KNOW: More than 50 movies have been made about Jesse James. Among the actors to portray the famous outlaw are Roy Rogers, Kris Kristofferson, Henry Fonda, Robert Duvall, Robert Wagner, Collin Farrell, Rob Lowe and Brad Pitt. GROUP TOURS: Discounts are available to groups of 15 or more. Contact the museum for details. From I-35 North: Take exit 26 to turn left onto MO-92 through Kearney. Then turn left on Jesse James Farm Road. Follow this road to the farm, approximately 1.5 miles. PARKING: Plenty of room for RVs. PUBLIC RELATIONS CONTACT: Beth Beckett, director of Jesse James Museum, 816-736-8502 or bbeckett@claycountymo.gov.